The Craft and Science of Coffee follows the coffee plant from its origins in East Africa to its current role as a global product that influences millions of lives though sustainable development, economics, and consumer desire. For most, coffee is a beloved beverage. However, for some it is also an object of scientifically study, and for others it is approached as a craft, both building on skills and experience. 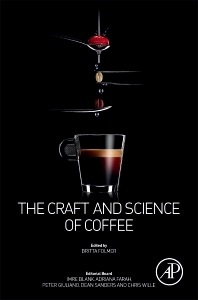 By combining the research and insights of the scientific community and expertise of the crafts people, this unique book brings readers into a sustained and inclusive conversation, one where academic and industrial thought leaders, coffee farmers, and baristas are quoted, each informing and enriching each other. This unusual approach guides the reader on a journey from coffee farmer to roaster, market analyst to barista, in a style that is both rigorous and experience based, universally relevant and personally engaging. From on-farming processes to consumer benefits, the reader is given a deeper appreciation and understanding of coffee's complexity and is invited to form their own educated opinions on the ever changing situation, including potential routes to further shape the coffee future in a responsible manner. Presents a novel synthesis of coffee research and real-world experience that aids understanding, appreciation, and potential action. Includes contributions from a multitude of experts who address complex subjects with a conversational approach. Provides expert discourse on the coffee calue chain, from agricultural and production practices, sustainability, post-harvest processing, and quality aspects to the economic analysis of the consumer value proposition. Engages with the key challenges of future coffee production and potential solutions. Dr. Britta Folmer is Coffee Science Manager at Nestlé Nespresso S.A. In her role she ensures that the science and expertise supporting Nespresso’s coffee quality and development is communicated the scientific and coffee expert community, as well as to consumers. Furthermore, she serves as scientific advisor for various coffee and product launches. Her way of working always aims at combining the knowledge and knowhow between scientists and crafts people. During her nine years at Nespresso, Britta has helped to establish the company as one with a solid scientific presence within the coffee community. Before moving to her current role in 2009, Britta served as coffee development and portfolio manager at Nespresso where she was responsible for management of coffee projects. Britta’s activities within the specialty coffee organisations include the SCAE Events Committee. She actively contributed to the creation of the new Sustainability Forum which was launched at the World of Coffee in Dublin. Talking coffee from the science point of the view, great book. It is excellent for my research. Don't miss out this book if you want to know more and more scientific knowledge about coffee. It's a materpiece of coffee books.